The performance of Haydn’s “The Creation” on Thursday was not your typical straightforward Mostly Mozart Festival presentation. During the sublimely contented scene for Adam and Eve, the blissful pair gave praise to God while submerged to their necks in a tank of water. The choristers stood in the aisles of the theater dressed in ragtag street clothes, holding supersized helium-filled balloons. 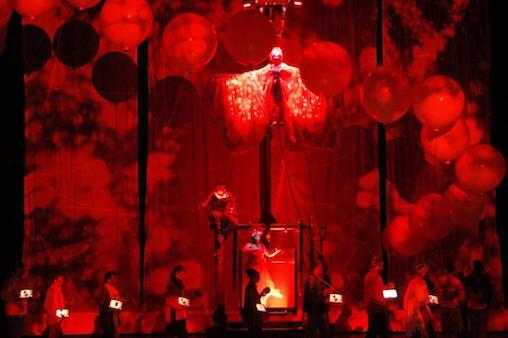 This was the North American premiere of a staged production of Haydn’s 1798 oratorio by Carlus Padrissa, of the Barcelona-based experimental theater group La Fura dels Baus. The presence in the pit at the Rose Theater at Jazz at Lincoln Center of the period-instrument Insula Orchestra from France, conducted by its founding director, Laurence Equilbey, and the participation of Ms. Equilbey’s Accentus choir, shows Mostly Mozart making good on its promise to reach out to international artists and broaden the range of its offerings. This summer, Lincoln Center has canceled its ambitious (and expensive) Lincoln Center Festival. The idea is that Mostly Mozart will stand alone, encompassing its traditional concert offerings (cut down this year) as well some of the adventurous projects that once defined the Lincoln Center Festival, like this staged “Creation.” But the overall volume of presentations has markedly fallen. Ambition isn’t new to Mostly Mozart; in 2015, for example, it presented the American stage premiere of George Benjamin’s opera “Written on Skin.” But Lincoln Center still needs to figure out how tradition and innovation mix in its summers. It’s hard to know what this new Mostly Mozart brand stands for. The angel Raphael (the bass-baritone Thomas Tatzl, wearing grayish robes run through with small colored lights) intoned the familiar words from the first verse of Genesis with stentorian gravity. In this production’s most affecting directorial touch, the chorus members are a downtrodden group of migrants or refugees, outcasts from the heavenly realm. If there was vagueness in the staging, this in some ways enhanced the dramatic ambiguity at the core of the work, often glossed over in performances. While we are witnessing the creation in real time, the miracle of God’s work is also being reflected upon, as if in the future, in choruses of praise. It was especially moving to see these homeless vagabonds banding together to sing Haydn’s marvelous choruses. In another poignant touch, the choristers had iPads. As they held up their devices, images of flowing rivers, flying birds, milk gushing from udders of cows and more played across rows of screens, emphasizing how isolated these refugees were from the real things. The tenor Robin Tritschler’s clear, strong voice lent authority to his portrayal of the angel Uriel. Mr. Tatzl made a magisterial Raphael and, in the final part, a take-charge Adam. The soprano Christina Landshamer, as the angel Gabriel, brought a luscious voice to Haydn’s beguiling arias, often while being suspended by cables hooked to a mechanical lift that dominated the stage. As Eve, she had to affirm that her adored Adam’s will was now also her will. The sexism of this stood out more in this contemporary staging. Still, she sang beautifully. Ms. Equilbey drew lithe, impressively natural playing from the excellent orchestra. And the great final chorus of praise, a stirring fugue, could not have been better.